The term “Covered Business Method” seems a bit dry, but if you’re interested in making life tougher for patent trolls you’ll get acquainted with it. Last week, I focused on one of the Obama Administration’s Executive Actions: the effort to tighten functional claiming. That Executive Action is directed to stopping the flow of new, overbroad software patents. But what about the overbroad patents that are already out there? One part of the solution is to make it easier to get the PTO to review those patents. The Covered Business Method (CBM) review program, which was implemented by the America Invents Act, is a good candidate to use. Here’s why: a person can request CBM review of a CBM patent (I’ll talk about what that means below) at any time, so long as the patent has been asserted against the requestor. You can request review based on any validity argument, and if there’s an infringement lawsuit pending, the judge is encouraged to stay (i.e., put on hold) the lawsuit until review is done. CBM review is not cheap (the fee alone is $30,000), but it’s much cheaper than litigation. Also, businesses threatened over the same patent can pool resources to jointly file a CBM petition. The two other types of review created by the AIA, inter partes review (IPR) and post-grant review (PGR) are substantially more limited. For example, you can only request IPR based on certain prior art references, namely printed publications or patents and no other grounds of invalidity. And you can only request PGR on patents filed after March 16, 2013, and then only within the first 9 months after the patent issues. So PGR can’t help with most of the patents that trolls are currently using. There’s also no provision in either IPR or PGR to encourage a judge to stay a lawsuit if either type of review is going on, so neither type of review helps avoid the costs of litigation. Unfortunately, CBM review is only available for a limited group of patents: financial services patents that are not technological. Also, the program ends in 2020. But if CBM review could be used on more low-quality patents, victims of troll suits would have a potentially powerful tool to fight back with. That’s one of the legislative proposals that President Obama announced last week: expand the transitional program for reviewing Covered Business Method patents to more generally include computer-implemented patents. As we’ve noted, Senator Schumer has introduced a bill, the Patent Quality Improvement Act, which expands the program and makes it permanent. The expansion of [CBM review] will benefit businesses in multiple ways. For any business that has actually been sued, it provides a cheaper exit strategy. More broadly, the very existence of this offramp will discourage trolls from suing. If a troll knows he can no longer trap a defendant in expensive and lengthy litigation, his interest in the suit will diminish substantially. And American businesses can get back to the work of innovation and growth, rather than frivolous litigation defense. 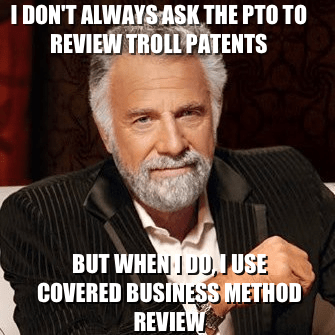 In fact, the PTO just issued its first review of a CBM patent, owned by a patent troll called Versata, and the relevant claims were cancelled as being unpatentable subject matter. Considering that the accused infringer, SAP, lost a $351 million jury verdict, that’s a big deal. Considering how much of a difference this expansion could make, it’s no surprise that a number of big names for hire have come out expressing “concern” about expanding CBM review. Stoll, now a patent attorney at Drinker Biddle, is especially concerned about unintended consequences of the proposal to expand the subject matter of “business method patents” that can be challenged. Right now, such patents include processes like those behind the buying and selling of stocks, or how an insurance company decides what to charge consumers. The Obama administration is pushing for legislation to expand that category to cover “computer-enabled patents,” which could include software. When I first read that, I wondered what Commissioner Stoll was talking about. Why would it matter to an investor in a startup if a patent covering the startup’s business could be challenged? The challenge would only be possible if the startup threatened or sued someone on the patent, so how does that affect the decision to invest in a developing business? Then I realized what he was actually saying: if we expand CBM review to cover more business method patents, it’ll be harder for inventors to sell those patents to trolls. It also means that a large company with some old patents that aren’t worth the maintenance fees might have a tougher time unloading them by selling them to a troll. Obviously, Commissioner Stoll thinks that’s a bad thing. But it’s nice to know that he thinks that Senator Schumer’s bill (and the Obama Administration’s similar proposal) will actually work. Of course, we’ve had special procedures for challenging particular classes of patents for years: for example, pharmaceutical patents are the subject of the Hatch-Waxman Act, which creates a special type of infringement and a process for challenging validity for just for those patents. That process was created because of the nature of the regulatory and litigation environment for pharmaceutical patents. We now have a litigation environment with business method patents that is filled with abuse. Again, we’re talking about allowing the PTO to review patents that someone is using to threaten or sue. To the extent a patent is more valuable because it can be used more effectively as a tool for extortion, that’s hardly a benefit to innovation. We don’t want more patents; we want more innovative products and services. If patents help get those products and services, that’s good. If they make it harder, that’s bad. Patents are not the end goal here. Which is a long way of saying if your patents are worth less because they won’t stand up to a challenge, who cares? That’s exactly what should happen.